This was a tough one! Thanks to all of you who participated in the contest. I loved all your guesses, and I especially loved having so many first-time commenters (is that a word?) leave their two cents. Unlike Bali, Tahiti or Thailand, Micronesia is not a common travel destination, so I can see why nobody got the correct answer. 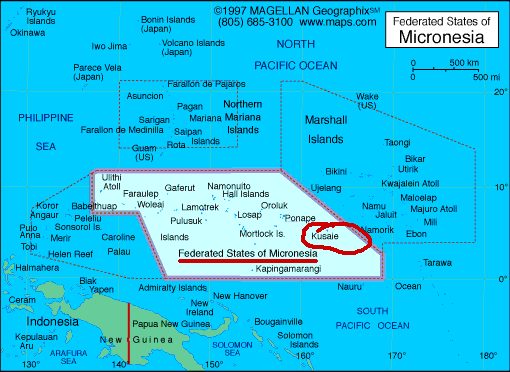 The official name for Micronesia is The Federated States of Micronesia. It consists of four island states: Yap, Chuuk (Truk), Pohnpei (Ponape), and Kosrae–all in the Caroline Islands (I know, islands within islands are a bit confusing). Take a peek at the map below to get your bearings, and just know that Micronesia is located about 3,200 miles west-southwest of Hawaii, above the equator in the Pacific Ocean. Jeffrey was photographing a travel story here many years ago for Continental Airlines and captured the fisherman in yesterday’s photograph as he cast his net at sunrise on the island of Kosrae. When I reviewed Eric Weiner’s book, The Geography of Bliss last November, I asked Jeffrey to rank some the happiest places he’s worked in the world, He described Micronesia as being the 4th Happiest Place. If you’d like to know why and see a few more photographs, you can click on my previous post: The Geography of Bliss (once you click on it, scroll half way down to get to Micronesia). The most significant change to Micronesia since Jeffrey worked there in the late 80s is the impact global warming has had on the island chain. Micronesia, as well as many others in the South Pacific, are alarmed by the rise in ocean levels, which threaten low-lying islands with flooding and, eventually, submergence. Now that has a way of putting our environmental issues into perspective! This entry was posted in Photography, Travel and tagged cultures, fishing, kosrae, microneisa, photography, photos, pictures, south pacific, traditions, travel by Becky Green Aaronson. Bookmark the permalink. I think you need to make the next test a bit easier. 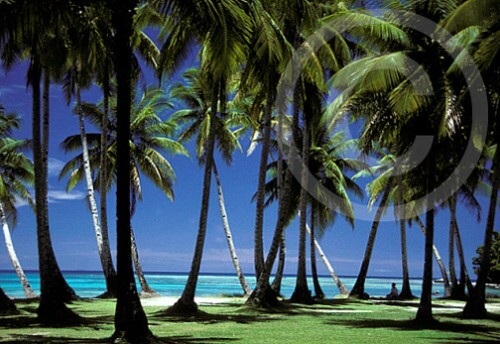 That last photo of Micronesia is absolute paradise! Too bad about the global warming effect, though. Sure does put it into perspective. Scary, if you ask me. Almost twenty years ago I opted to remain in your fourth happiest place and have been teaching out here ever since. Great photos. Lucky you! I’d be curious to know what you love most about living in Micronesia. After almost two decades there is no one thing, this is simply home. You can tell I was a good test taker . . . 😉 I challenged myself before looking at the answer. Funny thing is, I was going to write ‘my idea of heaven.’ Bliss is pretty close. Gorgeous photos. I’m impressed that you didn’t take a peek at the answer first. Bali was close, but bliss is spot on. Not sure I would have guessed Micronesia. Have visited Truk many times when I was living in Guam. Amazing diving.. what a great adventure! I forgot you lived in Guam (or maybe I never knew that). You have lived an interesting life, my friend! 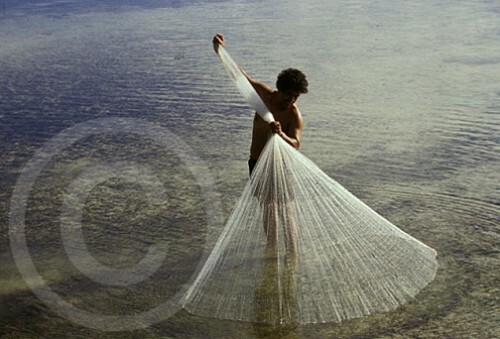 not too far from Tahiti… ive seen a bunch of villagers working together with nets like that in Morea. Oh, of course – Micronesia! That’s just south of Megadonia, right?. I joke… haha. I see stand-up in your future! I could never do stand up comedy. I can write comedy, perhaps while standing if I had a podium for my computer, but that’s it, ha ha! Yeah, that was a toughie! I wanted to say Thailand. I’ll provide the tropical drinks. You bring the bonbons.